This is a fantastic collection of short stories. Matt Bell shows a great deal of range in styles and settings -- from the OuLiPo influenced "An Index of How Our Family Was Killed," to the extended and subdued horror of "The Receiving Tower," from the fantastically rearranged story of Red Riding Hood in "Wolf Parts," to the nightmarish story of the Collyer brothers, historical hoarders extraordinaire, in "The Collectors." As a writer of short fiction, Matt Bell contains multitudes. The range of the worlds he creates in this collection, and the consistently high level at which he is writing throughout, are impressive. I raced through the collection, and am planning to re-read it soon. 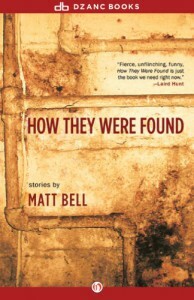 Recommended to adventurous readers willing to go wherever Bell takes them.